We need your help James Chartrand. We heard about your Damned Fine Words Writing Contest and we want to win. Here’s why winning your contest is so important to us. We need to cut through the media clutter and touch people in a way that leaves them still thinking about us days, weeks, maybe months later. Then we need them to start to look differently at the way they buy food. We don’t need drastic changes – small ones really do make a big difference. We have a small farm in Western Pennsylvania where we raise Heritage breed American Milking Devon cattle. Our little herd of old-fashioned cattle has the kind of DNA capable of reviving an ailing livestock gene pool, which, most people have no idea, is a real problem in today’s system of industrial agriculture. Our cows are scrappy. Survivors. Tough. The kind of cows who will be just fine when farmers can’t afford to feed those bovine CAFO hummers our beef and dairy industries are reliant on today. Our work is all about preserving the knowledge of the past and putting it to use in a modern way. Not because it’s charming or trendy, we do it because we believe it is critically important to retain this knowledge and biodiversity. But our effort falls short if we can’t financially support ourselves or get people engaged in our outreach. Today, it’s a little easier to find information about real food and the importance of small, diversified farms, but you still have to actively work at it. Mainstream media offers corporate greenwashing and incomplete, sensationalized information and the contradictory stories tend to be more confusing and polarizing than helpful. We also worry that since so many of the artisan and DIY food & farming conversations take place in a rarefied “foodie” atmosphere, many people won’t think the work of farmers like us is relevant or affordable to them. We need them to know how wrong they are; small, diversified farms provide important food insurance for everyone. We want everyone to know they can afford quality food. There’s an overwhelming flood of critical issues generated by our industrial food and farming systems these days. And so many small actions people could be taking but are not either due to misinformation, or complete lack of awareness. There are many, many painless and affordable actions which if adopted by enough people, would create huge improvements in the health and welfare of people, animals, the environment and the economy. 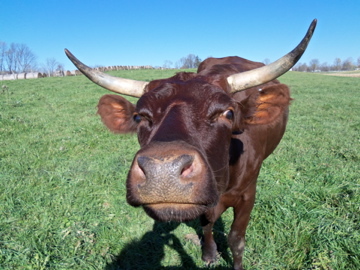 Auburn Meadow Farm has much more to say than our audience’s attention span can possibly bear. And we won’t browbeat or frighten people with misleading or sensationalized information. Instead, we want to inspire people to action in an upbeat, proactive and positive way. Being so small, and not on the receiving end of farm subsidies and assistance, we need our business to be as scrappy as our cows with multiple streams of income to keep our mission moving forward year round. We believe developing the quality of our writing and teaching program will create not only a valuable reference for our readers and students, but a reliable source of revenue for the farm. Our budget is extremely tight and this year does not allow for investment in education. The type of mentoring and community we would enjoy in your course would really help us make this a successful and exciting year. Regardless of whether we’re selected or not, we thank you for all the helpful sharing you do on the Men with Pens blog. 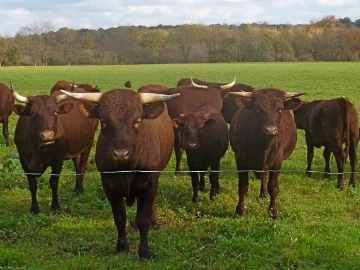 You may not know us personally yet, but you’ve been an important member of our imaginary herd tribe. But we’re thinking positively and look forward to being an active part of your real herd. We want to join your damn fine words herd! How do we help you win?? Can we vote? Sending a ton of positive thoughts. Jackie, I really do think that sometime in the future we might try a collaboration. This statement : What we want is to teach people: How to buy and prepare food that is cheaper, healthier and tastes so much better – it’s so important to me. Thanks Tammy! Let’s do it soon! I grew up and still live in a small farming community in southern Kentucky. Dad and I raised beef cattle until he got tired of it. It was a hard life at times, but I do miss it in a way. I find your website very interesting and will be following along. Good luck with your farm. Thanks Tim. I love Kentucky! Raising cattle is hard some days, no doubt. Thanks so much for the visit, hope to hear from you again soon. Now THAT is an *awesome* message and mission! You’re definitely someone I’d love to get to know, and I’m crossing my fingers that we both WIN!!! I really do hope you win. Besides the fact that you’re already a great writer, I love the idea of preserving genetic diversity, improving the quality of our food, and your scrappy cows. I think you’ll take what you learn and change the world. Good luck! Good luck and I hope you win! You have a compelling perspective on a topic that I really don’t know much about. What the public usually hears is the debate between vegetarians and carnivores. You should either eat meat or not. It’s refreshing to hear the possibilities of the farming industry and how there can be healthy and affordable food options. argument at that. Thanks for the well wishes Chris and the visit. I appreciate it! It might be surprising that before raising beef, my solution was to become a vegan. Thank you Kari, that’s so nice of you to post.